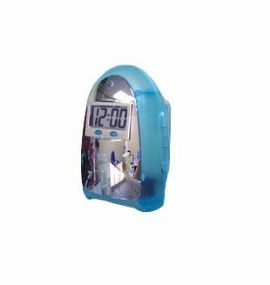 Amazing Water Clock (PI-3206) [The Amazing Water Clock PI-3206] - $13.95 : NewDaVincis.com!, Great Innovative Products, Gadgets and more. Without batteries, electricity or any other power source the large LCD displays the time and date in clear easy to read numbers. Amaze your friends! Teach children the science of molecular energy! Science and engineering come together to create The Amazing Water Clock. Our exclusive state of the art Energy Converter extracts electrons from water molecules to form a steady stream of electric current which act as fuels to generate electricity which drives the clock. A truly green product, it's an all naural wonder. Educational and entertaining, pollution free and enviromentally friendly. Just pour a little water (or any liquid) into the tubes on the back of the clock. Displays Time, Month and Date. Translucent blue with mirrored front.